That is some beautiful country! I am enjoying following your ride. Maybe someday I will do the same! It would be a great way to see the place my grandfather came from! Thanks Jim. Cycling is certainly a good way to see this part of the world - if you don't mind a few hills! There's a point where all three countries meet? Gee, I never noticed. Thanks for sharing your beautiful view. Yes, and there are three more. 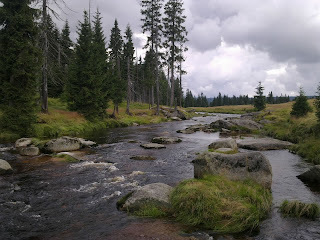 The CZ-DE-AT tripoint in Šumava National Park seems to be out of bounds for cyclists, but I hope to visit the CZ-AT-SK and CZ-SK-PL ones later on my tour.